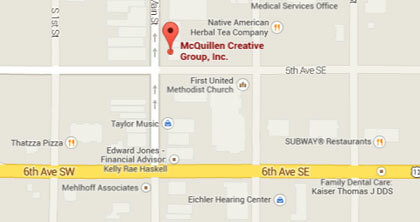 See how your business can benefit with McQuillen Creative Group on your team. Use the form below to contact us about your next project (logo/brochure design, website, video production, or advertising) or call us at (605) 226-3481. We’ve been in business since 1995 with the same owners, same creative energy, same commitment to you, your challenges, and your goals. When you partner with McQuillen Creative Group we promise to provide you creative assets, designed to make your marketing and advertising have more impact and engagement. When you invest in our creative service, you are investing in bettering your brand, resulting in more awareness, more customers, and more sales. Our goal is to help you succeed for an investment that’s fair and appropriate, not simply equal to the high end of your budget.